Litchfield National Park is the most popular park in the Northern Territory and the local saying is Kaka-don’t Litchfield-do. The reason is, Litchfield National Park offers year round croc free swimming amongst attractive and easily accessible surroundings. A popular and recommended day trip from Darwin. The 143,000-hectare Litchfield National Park is characterised by a spring fed Plateau. Unlike Kakadu and other spots in the top end, waterfalls flow all year round at the Litchfield, even late in the day it when it hasn’t rained in six months. Each wet season the escarpment is deluged by monsoon rain. Some water collects in creeks, which flow across the plateau and over the waterfalls. The remaining water soaks down into the rock to the water table below. Here it is stored and slowly channelled to the face of the escarpment where it emerges as springs. The springs continue to flow throughout the dry season fed by the water stored within the range. Road access to the Park is via three routes. A sealed road through the township of Batchelor, the turn off via Cox Peninsula Road which includes 42km of gravel. This gravel road is cut off during the wet and can be rough until it’s been graded so 4WD’s are recommended. The third access road to Litchfield National Park is the 4WD track travelling North-South through the park, and it has a number of creek crossings including the very deep Reynolds River (snorkel mandatory early in the dry). When you have arrived at Litchfield National Park, the majority of attractions are linked by a sealed road. A four-wheel drive is only required if you want to access the more remote natural attractions in the south of the park. For 4WD enthusiasts, Litchfield National Park has a number of 4WD tracks to suit varying levels of experience including a difficult 4WD track for experienced drivers with high clearance vehicles. Litchfield Rd to Daly River Rd (4WD): The 4WD track travelling North-South through the park has a number of creek crossings . This track is closed during the wet. If you are planning to travel this road through it is recommended that you check if a snorkel is required for the Reynolds River. The road accesses some idyllic camp grounds and attractive uncrowded waterfalls such as Tjaynera & Surprise Creek Falls. This road also has an amazing magnetic termite field that lasts for many kilometers and offers an eerie cemetery type landscape. Travel time is 3.5 hours one way not including stops. Batchelor: A small town with over 500 people Batchelor was a defence base during WWII. An extension to the mid 30’s airstrip occurred in 1941, which would be unremarkable except it has a railway line crossing through it. The extension was necessary to accommodate the large US B-17 flying fortress aircraft, which operated here following the bombing of Pearl Harbour. Batchelor has all the amenities including service station and Caravan Park. Batchelor Butterfly Farm Northern Territory’s only Butterfly Farm situated in the heart of Batchelor. Explore the NT’s first butterfly sanctuary and discover the delightful display of flora and butterflies. Meneling Road Batchelor NT, Ph: 08 8976 0199. Bamboo Creek Tin Mine:Until the early 1950s, the park was site of several tin and copper mines and relics of this mining era can be seen at Bamboo Creek Tin Mine. The wide variety of remains which survive are in good condition. The walk takes you to the old mine site at the base of the Tabletop Range then does a loop around the site including a climb up the hill to the old mine shaft. The walk is only 1km and takes 15mins but allow 1/2 an hour. Blyth Homestead Ruins: Blyth Homestead is one of few existing examples of buildings that were formerly common on NT pastoral leases. The homesteads’ construction is cypress pine held together by heavy gauge wire and covered with sheets of corrugated iron. Established in 1929, This home was eventually sold by the second owners to the Territory Government to become part of Litchfield National Park in 1985. Standing before the home, you can appreciate the tough conditions faced by the pioneers in remote areas. This home was lived in until 1985. A worthwhile detour if you are exploring the southern part of the park by 4WD. Buley Rockhole: Buley Rockhole is a long series of cascading plunge pools and it rivals Wangi falls as the most popular spot in the Park. The cascades and plunge pools run for a length of 90m from the top entry point to the bottom entry point but can still get crowded during the peak season. A walking trail from Buley Rockhole follows Florence Creek to the top of the escarpment and on to Florence Falls. The walk is 3.2km return and will take 1 hr excluding a swim. An easier way on a hot day is to drive. Cascades: Not as well known as the other waterfalls and swimming holes so less crowded during the peak season. A 4km return walk takes you through woodland to the top section of the Cascades. A second 3.5km return walk takes you along the spring fed creek through Mount Ford Gorge to Curtain Falls. You can clamber up Curtain Falls and continue to follow the creek up to the Top Section of the Cascades and jpoin the other walk to come back. Florence Falls: Florence Falls is a spectacular waterfall with crystal clear pool at the base of the falls. There is a specially constructed lookout with wheelchair access offering excellent photo opportunities. A steep walking track leads down to the swimming via a specially constructed stairway. For those that don’t want to walk to the base of the falls there are several small pools near the picnic area. As with all waterfalls in the Top End be careful during the wet season because strong undercurrents occur as large volumes of water flow. Magnetic Termite Mounds: Reminiscent of a graveyard with 2m tall thin headstones these formations are in fact magnetic termite mounds. The mounds are orientated in a north- south direction so as to present the eastern and western faces of the mounds to the morning and afternoon sun. The architecture presents a thin edge to the midday sun, thus striving to keep the habitat at a termite-preferred 30°C. As the morning or afternoon sun heats a side of the mound the termites move to the other. You can feel the temperature difference. There is an informative bay and boardwalk, which has been constructed to control access to tourists and therefore protect the mounds. 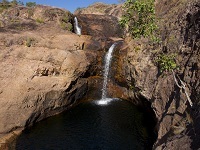 Surprise Creek Falls: Accessible by 4WD from the Litchfield Rd to Daly River Rd (4WD), There is a short walk to a series of waterholes, which finally lead to the main deep plunge pool. The water flows all year round and nearby spring and good exposure to sun makes for temperate water temperature. A recommended spot for people looking to get away from the crowds. The Lost City: The Lost City is a natural formation, whose walls, narrow passages and domes give the impression that they were man made. Accessible via a 8 km four-wheel-drive track that becomes difficult as you approach the formation. Beyond the lost City the road to Blyth Homestead is very difficult and should only be attempted by experienced people with high clearance vehicles. Tabletop Swamp: A poor choice of name for what is effectively a billabong. It is unique to Litchfield and something you would expect at Kakadu not here. Its only a short drive and short walk to observe the birdlife and recommended as a quick detour if you haven’t or aren’t planning to visit Kakadu or the Mary River Wetlands. Tjaetaba Falls: A 1.8km return walking trail leads from the Greenant Creek carpark and picnic area to Tjaetaba Falls. Initially a pleasant walk through rainforest it then climbs steeply to the top of the escarpment to another attractive plunge pool. Swimming is at the top of the falls rather than at the bottom and is typically uncrowded. The designated lookout platform just before you get to the top offers spectacular views. Allow 1hr for the return walk and time for swimming. Tjaynera Falls: Accessible by 4wd only. The falls and plunge pool is accessible by a 1.7-kilometre walk from the camping and parking area. The escarpment contains a number of cascades, waterfalls and small pockets of rainforest. The plunge pool would be as popular as Wangi if it was as accessible, but as a result it is relatively uncrowded. A good alternative to the very popular Wangi Falls if you have a 4WD. Tolmer Falls : Tolmer Falls can be seen from a specially constructed lookout easily accessible from the main road. Set amongst imposing red cliffs, the falls feature caves with hundreds of bats. To help protect these colonies, access to the falls and gorge itself is closed. There is however a 1.5 km walking loop that includes some attractive rock pools at the top of the falls. You are not permitted to swim in the pools directly behind the falls but those further back up the creek are fine. Walker Creek : Walker Creek is a series of eight walk in campgrounds. Securing a site is based on first come first serve and you have to carry all of your supplies and tents / sleeping gear with you. Each campsite has its own rockhole so you are rewarded with a private location to camp and great place to swim. For people who are not prepared to walk there are 2 day use areas with picnic tables and the opportunity to swim near the carpark although the section of river is not as attractive as further upstream. The walk up to the last camp, Camp 8 is 1.8 kilometres one way. Wangi Falls : Wangi Falls is arguably the most popular site in the Park and at times can get very crowded. It features a large natural pool created by a tall waterfall, cascading over red cliffs. Trees and fresh lawns fringe the entry to the plunge pool and is a great spot for a picnic. Wangi also offers a picturesque walking trail which leads from one side of the pool to the other via the top of the falls. This walk has won national awards for its design concept and includes a boardwalk, carefully constructed steps, and platforms to give visitors the best views. Despite signs warning of the danger, a number of swimmers have recently perished at Wangi. High volumes of water over the falls cause an undercurrent which can pull swimmers under.